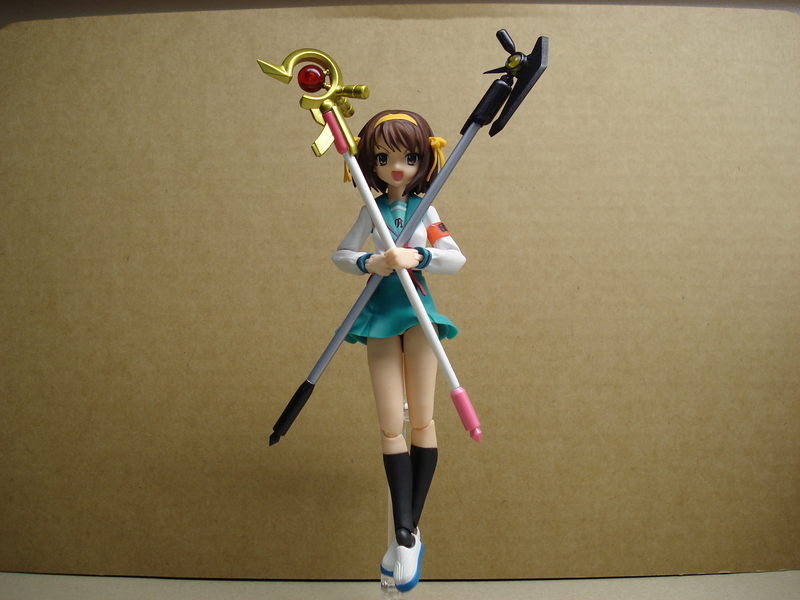 Published on October 17, 2008 in figma and Reviews. 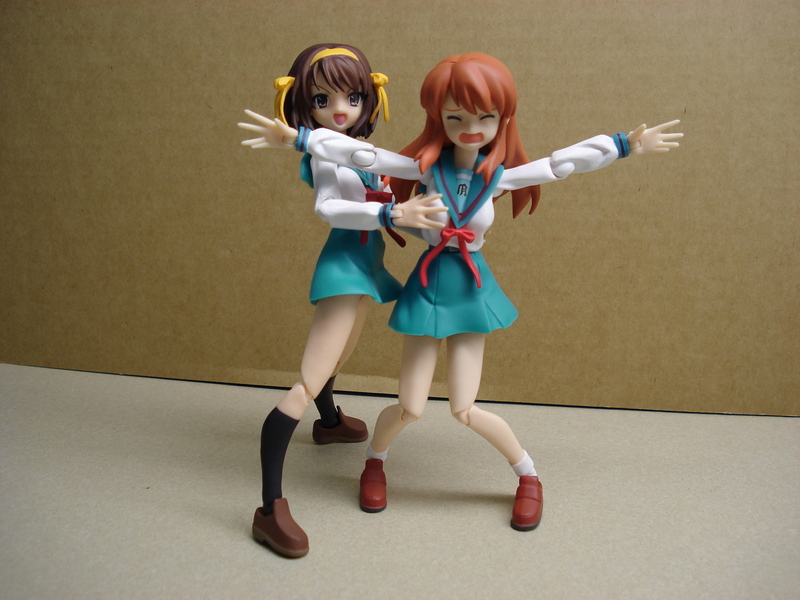 1 Comment Tags: figma, figma:haruhi, suzumiya haruhi no yuuutsu. 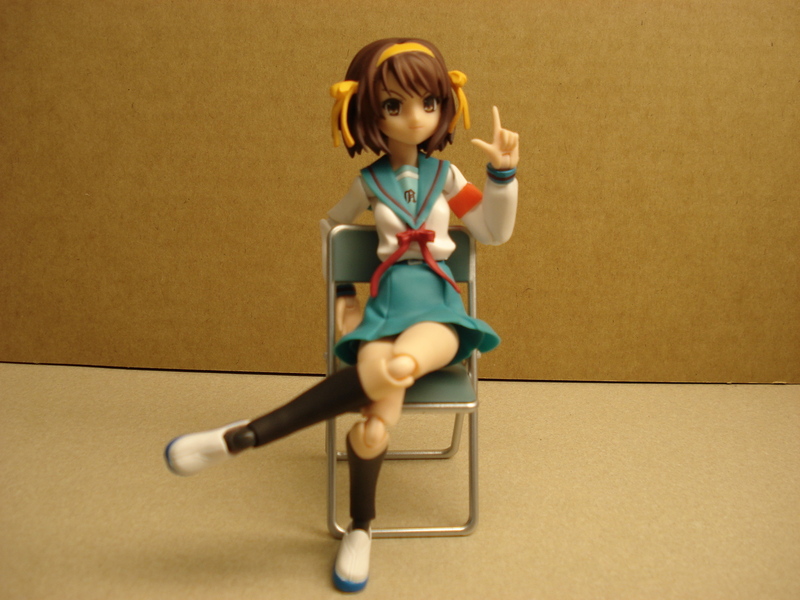 Today’s figma is the benevolent Suzumiya Haruhi, leader of the SOS-dan and hunter of espers, time-travellers and aliens. 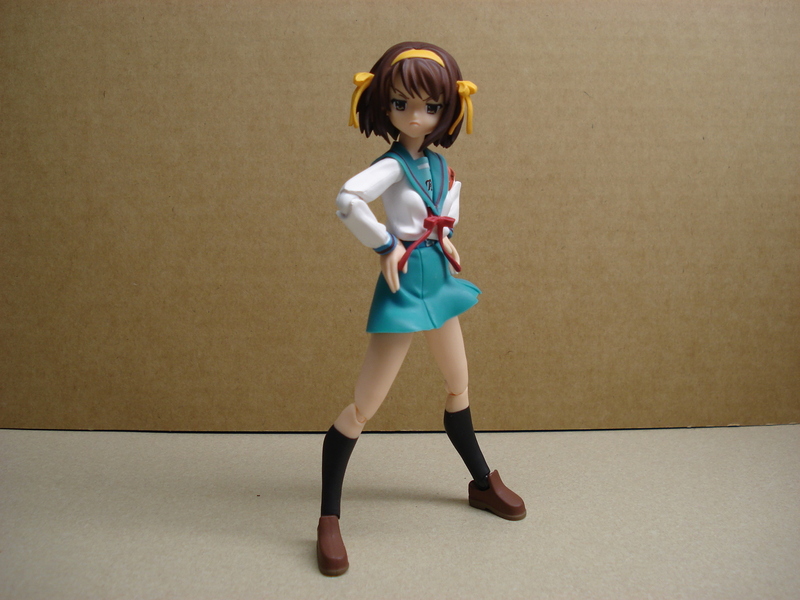 Once again we’re treated to an assortment of extras with Haruhi. 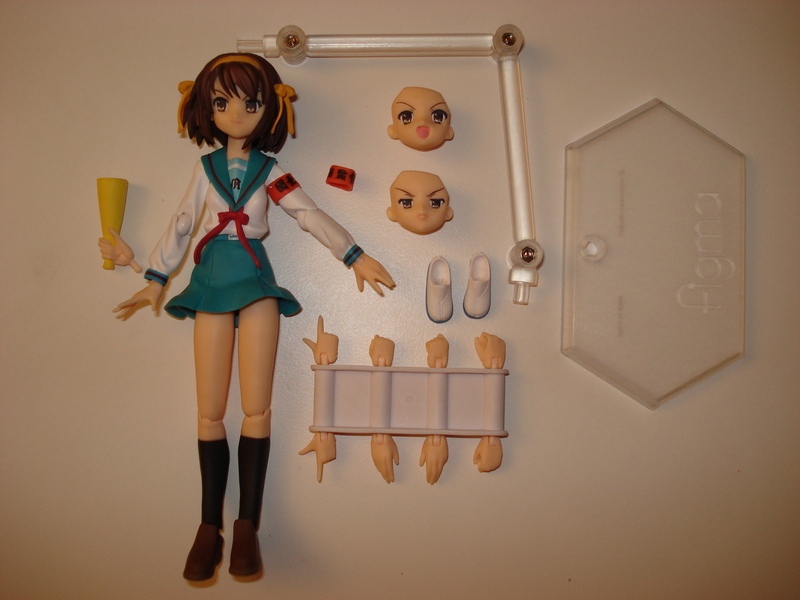 Not nearly as many as Nagato got, but as Nagato would put it, Haruhi’s accessories are ‘unique.’ The standard set of figma hands is included in the box along with the 3 jointed stand and base. 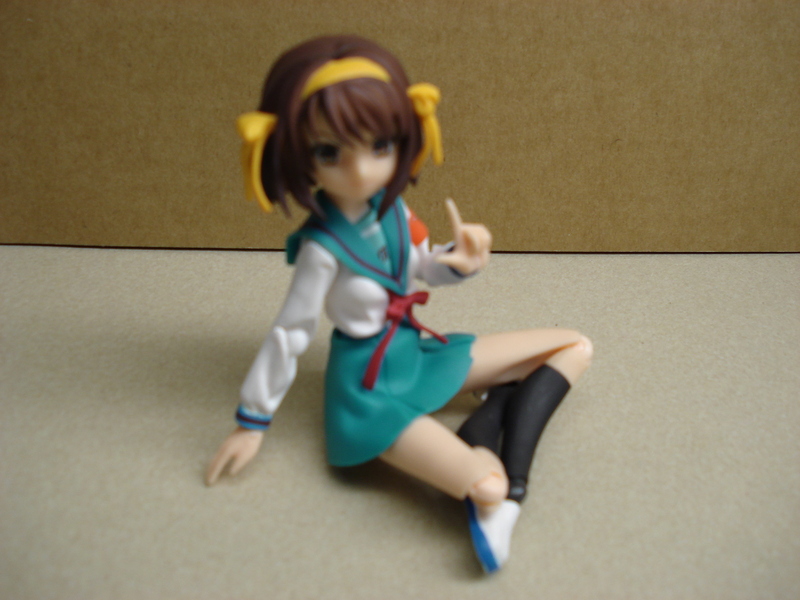 Haruhi comes with a pair of indoor shoes with the blue coloring since Haruhi is a first year just like Nagato. A yellow directors cone attached to an extra right hand is included if you want to pose her as an Ultra Director, along with the appropriate armband for her left upper arm. 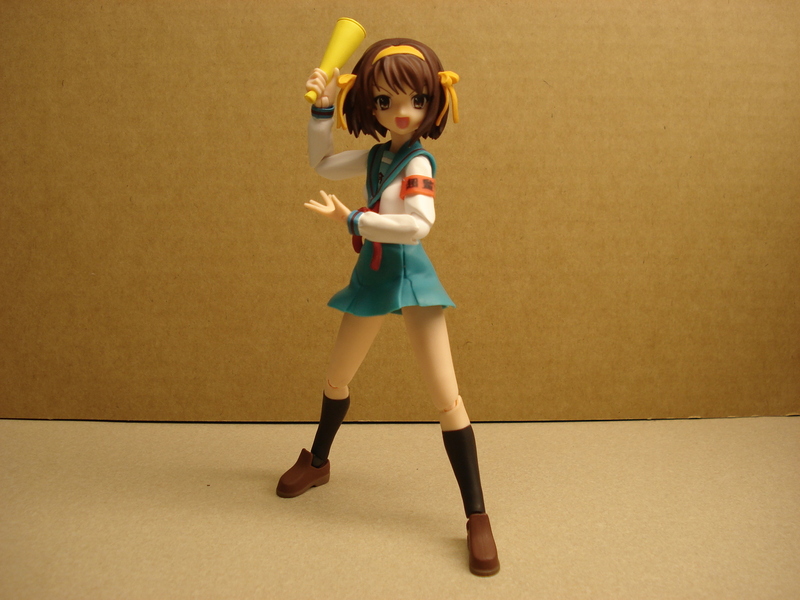 Because Haruhi displays a myriad of emotions, along with her smiling face, she comes with a happy face with her mouth open and a tsundere face as well. All of these accessories fit nicely in the standard figma bag that comes with all figma, with room to spare if you need some place to store your accessories for Chou Yuusha Haruhi if you have her. 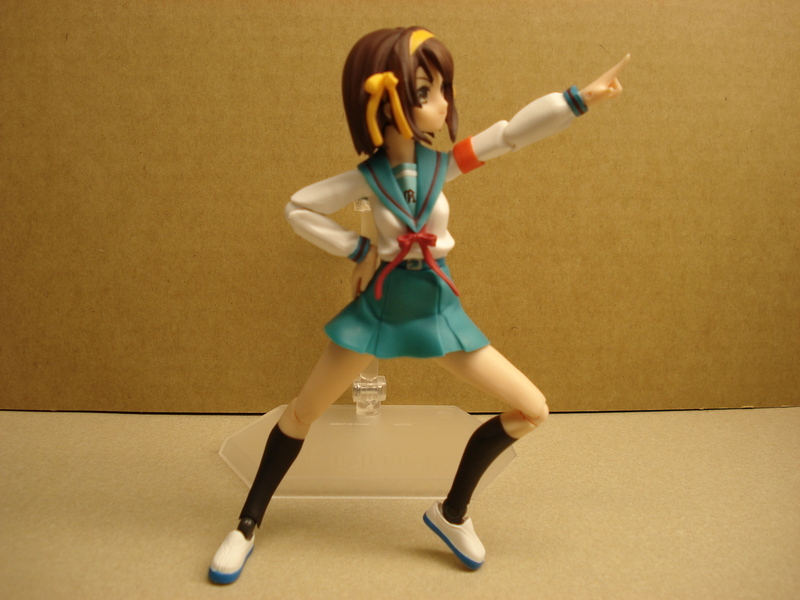 Pros: Another great release by MF and GSC, Haruhi is just as good as Nagato when it comes to quality. The faces fit snugly into the head piece, and the bangs with ribbons secure them in place easily. Her skirt is identical to Nagato’s which allows her to sit without showing any leg through her skirt, and when she stands back up it sets back into place. The extra hands fit very snugly, and the director’s cone has a joint in the hand as well, the wrist can move up and down. Cons: For some reason the extra shoes (and the ones she’s wearing) don’t have the labeling that Nagato’s does. If you look closely, you’ll be able to tell which shoe goes on which foot, but it is a little bit of a pain. 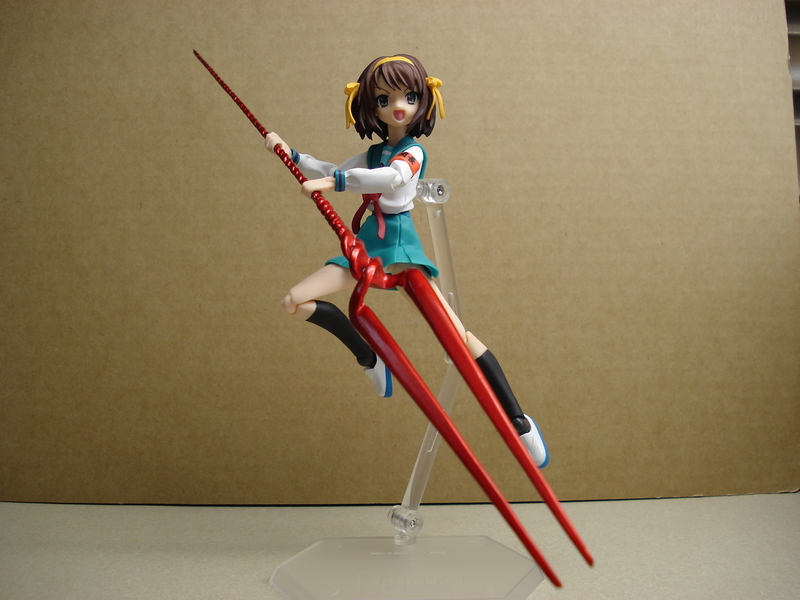 This may just be a problem with the particular run of Haruhi that I happened to get, but keep an eye out in case you get the same kind as me. Swapping the Ultra Director armband with the Brigade Chief armband she comes with is a bit difficult at first, since it seems like the dancho armband is glued onto the arm but keep at it! Just be very careful when attempting to remove the dancho armband the first time and ‘inch’ it slowly off the arm. Remember that the clothespin always goes on the upper left part of the armband, so you don’t accidentally put the armband on upside-down accidentally. 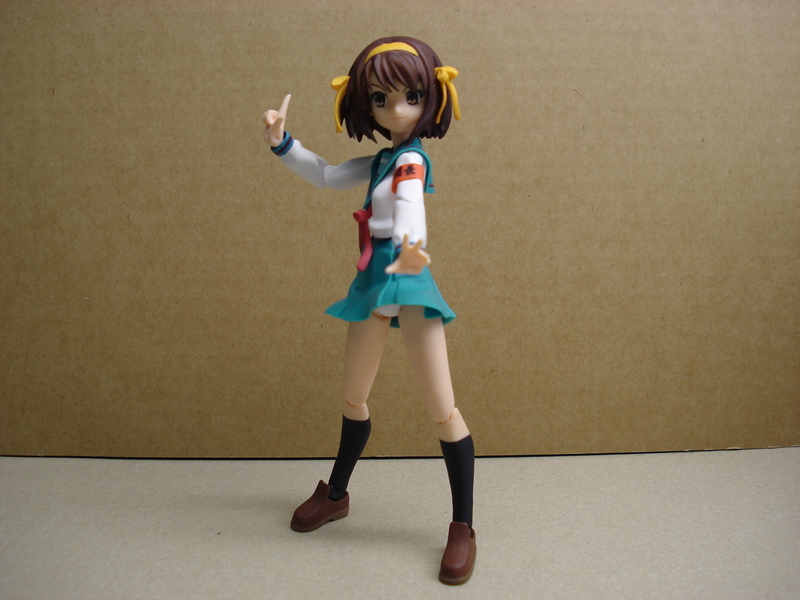 Since I love Suzumiya Haruhi no Yuuutsu, I absolutely HAD to get the SOS-dan, so Haruhi was a must purchase for me, same as Nagato. It’s fun to give her my other figma’s accessories to play with and pose, and as usual, the posability is a huge factor in a purchase for me. Like Nagato, you can find her at most online stores for around $25-30. Do it now, brigade chief’s orders!